Now then. It takes a lot to leave me speechless or indeed for me to really be stopped in my tracks at a restaurant view, but This. Is. Nice… I mean really nice. The nice that you remember 5 years later and return to find that it is just as spectacular as you recall but you’ve even mentally downplayed it in your mind until seeing it again. Welcome to Sirocco. When I say that this is high up, it is officially the world’s highest alfresco restaurant. It is on the 63rd floor rooftop to be exact and when you’re ears have un-popped and you step through the door outside, what you are faced with is a 63rd floor, unobstructed, outdoor 360 degree view of Bangkok. After you get your breath back, it is taken very swiftly again when you realise that you are literally on the precipice, at the top of a very grand golden staircase, with an incredibly limited railing… when i say railing, what I really mean is waist height glass barrier. None the less, the dizzying heights are more than worth it when you realise that you literally have a 360 degree view Bangkok from somewhere that makes you feel pretty special and lucky and everyone in there knows it. Head to the bar to get your courage back at the restaurants bar, “The Sky Bar”. It literally couldn’t be more aptly named. Cocktails such as… oh who cares… They were all delicious with a side helping of top of the world. If you were going to go for something a little jazzy though, I would recommend their the well-known Hangovertini, which was created for the cast of The Hangover Part II while they were filming at Lebua. As it suggests, if you have a couple, you wont remember them, but they are delicious. 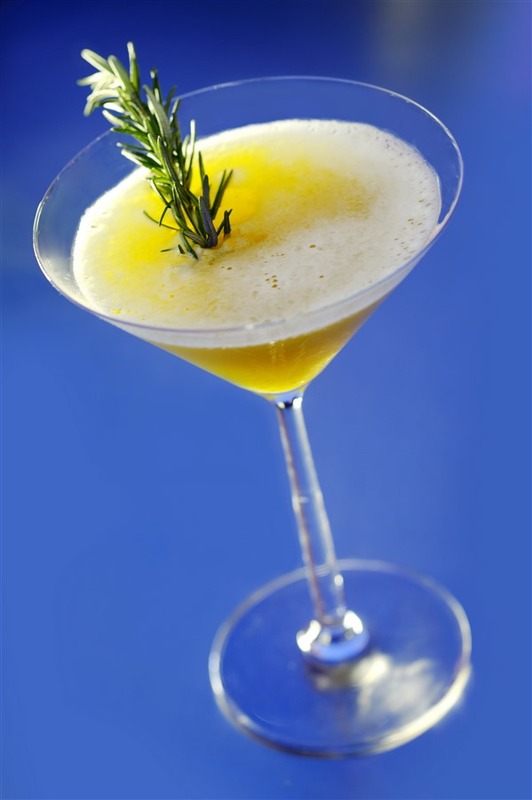 If you are curious, they are made with green tea liquor, Martini Rosso, green apple juice and rosemary-infused honey. Woof. Frankly they could serve twice baked flip flops and you would eat them for this view. Luckily for me, the food is top drawer. 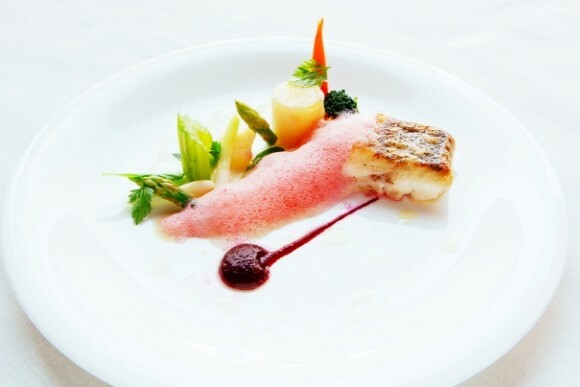 Essentially a mediterranean cuisine brought in by Chef de Cuisine Gonzalo Ruiz. 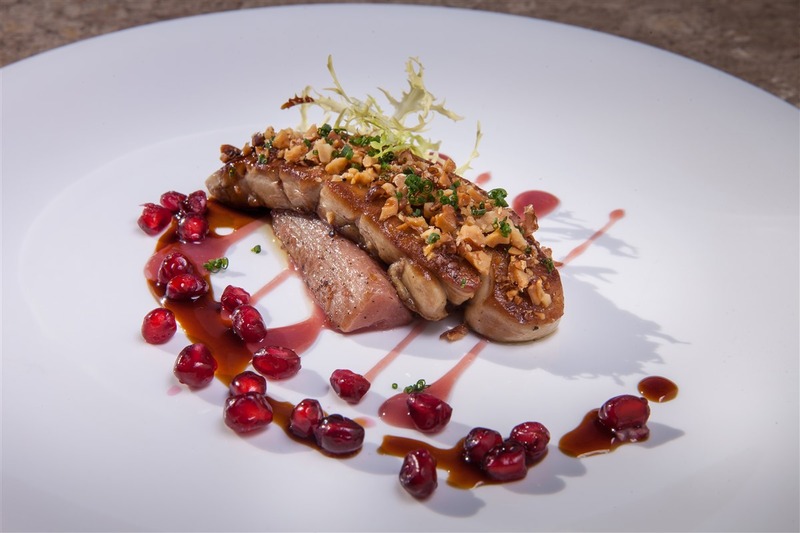 Particular mentions are well earned by the Seared Challans Foie Gras, served with Cauliflower, Royal Project figs & fig chutney, Ibérico ham, basil. Also a strong contender is the Pork Chop with “Ancienne” grainy mustard & parsley crust, Hasselback potato onion aux la sarladaise, spinach, mushroom, garlic; two ways, “Guinness” Ale sauce. Finally, the Dry Aged Prime US Beef. 21 day dry aged prime strip loin, charcoal frilled, sweet potato, red onion, artichoke, buttered polenta, cepes mushroom sauce is delicious. I tend to avoid meats from other continents when travelling as I want to have the very best of the homegrown (at least the same continent) meats, but this was a recommendation that I am glad I took. This place has won more awards from every major publication than you can imagine. From Best Restaurant to Best Bar to Places you need to go in your lifetime… Sirocco & the SkyBar have a pretty extensive trophy cabinet. Once you are there, you know why. Rarely will I ever see somewhere as jaw dropping in a restaurant again. So for now, everyone else has a very high bar to reach!